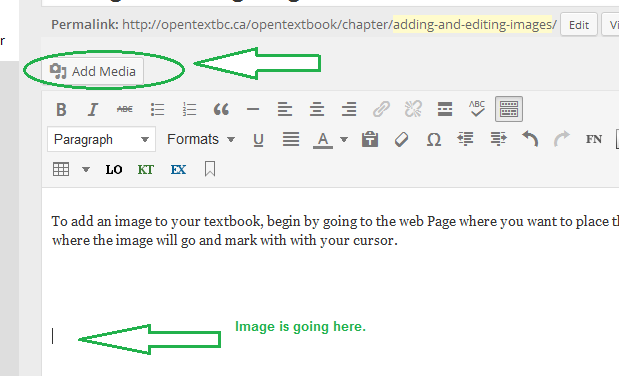 To add an image to your textbook, begin by going to the web Page where you want to place the image. Select the spot where the image will go and mark with with your cursor. Then click on Add Media button. Figure 1. Step one: find spot and click Add Media. 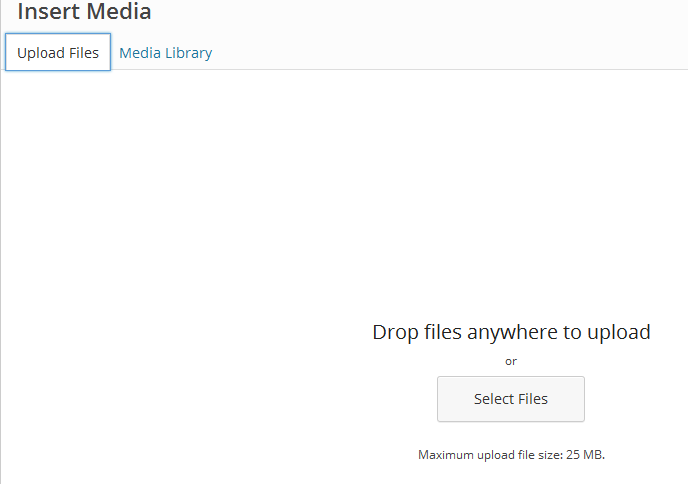 If you haven’t uploaded any files into the Media Library yet, click on the Upload Files tab in the upper left corner and “Select Files” in the middle of that page. This will allow you to search for image files to add. Note: files must be JPG, PNG or GIF. Other file formats will produce an error message and will not be accepted. Figure 2. Step two: Upload Media. If you already have image files in your Media Library, simply select that tab and the image you want to add or insert. The selected item will be encircled by a blue border and have a blue/white check mark in the top right corner. Figure 3. Step three: select image from Media Library. Complete this task by clicking on the Insert into post button in the bottom right corner. Figure 4. Step four: Insert image into post (web page). Note: an image file must be uploaded into the Media Library for use. You cannot add an image by linking to an external source. See “Editing an Image” below for details on how to adjust an image. 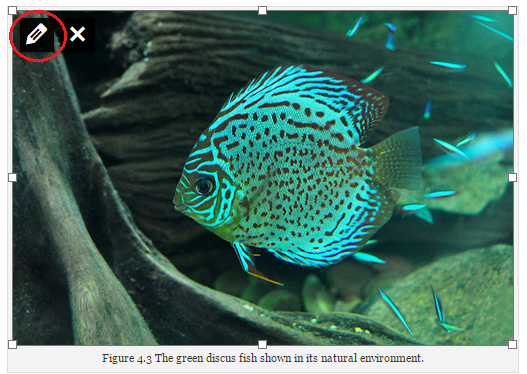 Images that do not follow the above guidelines often produce PDFs that are less readable. A PDF file is one of the many formats offered for most textbooks in our collection. It is also used to created request print-on-demand copies. To change the placement or size of an image that has been added to a page, simply click anywhere on the image. You should see a pencil icon and an X. Use the pencil to edit the image and the X to delete the image. Figure 5. The pencil icon for editing an image. Figure 6. Placement and size of an image. 3. 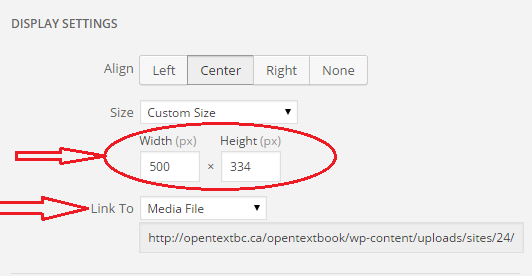 Using the Width OR Height boxes, enter the correct number of pixels. Note that changing one of these parameters, e.g. Width, will automatically adjust the other, e.g. Height. 4. 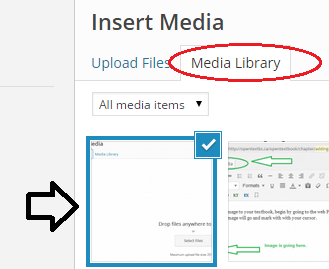 Ensure that “Media File” is selected by the “Link To” dropdown list. Figure 7. Customize the size and make sure image is linked to its Media File. 5. Save changes by clicking the “Update” button in the lower right corner of the page. Figure 8. Save with the Update button. Adding and Editing Images by BCcampus is licensed under a Creative Commons Attribution 4.0 International License, except where otherwise noted.